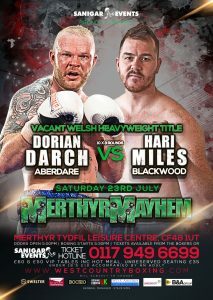 Dorian Darch and Hari Miles will clash for the vacant Welsh Heavyweight Title on Sanigar Events Merthyr Mayhem show, July 23rd. The Welsh title has not been contested in 27 years, since Llanelli’s Chris Jacobs beat Newport’s Andrew Gerrard on points at the Star Leisure Centre in Splott in 1989. Miles will be making his second appearance as a heavyweight after a points loss to undefeated prospect Nick Webb last time out. The 30 year old Southpaw certainly has the tools to win the title and at 6’4 has a clear height and reach advantage over his Aberdare rival. 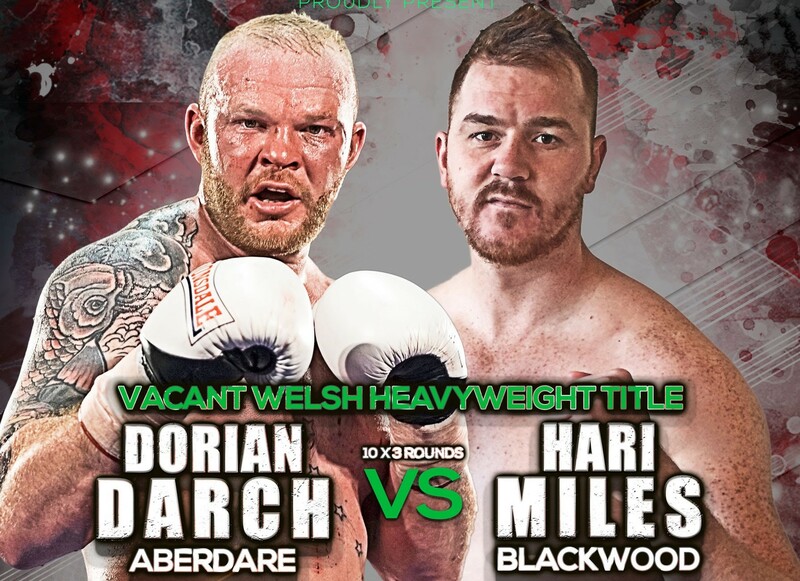 The Blackwood man showed a glimpse of his potential when he surprised many to reach the prizefighter final in 2013, his clash with Darch will put Miles back in the mix if he can produce a career best performance. Darch will be entering the ring as the favourite on paper with an 11-4 record, winning his last 3 fights at home. Despite being 2 years older and 4 inches shorter than his rival Dorian is unlikely to be phased, having faced the likes of Anthony Joshua and Hughie Fury in his 5 year career. A win against Hari Miles edges Dorian towards more fiery domestic clashes in a thriving UK heavyweight scene. Tickets £35 Unreserved Seating, £50 & £60 VIP Table Seating including a hot meal available from all boxers or call the BOX OFFICE 0117 9496699.